The ones with a darker color are sometimes mistakenly named yams. Yams are harder in texture, and have a distinct earthy flavor, and are whitish to purplish in color. Sweet potatoes can be of various types, with orange, yellow, purple, and white flesh. They may also be different in size and shape, from blocky and short to thin and long. Especially the ones in deeper colors are high in carotene, which is a precursor of vitamin A. They are also abundant in vitamin B6, vitamin C, B2, E and biotin (B7). Sweet potatoes are also rich in minerals like iron, copper, manganese, and folate. They are also rich in dietary fiber, and pantothenic acid. Additionally, they are a rich source of plant proteins, and are low in calories and sugar, so they regulate blood sugar. 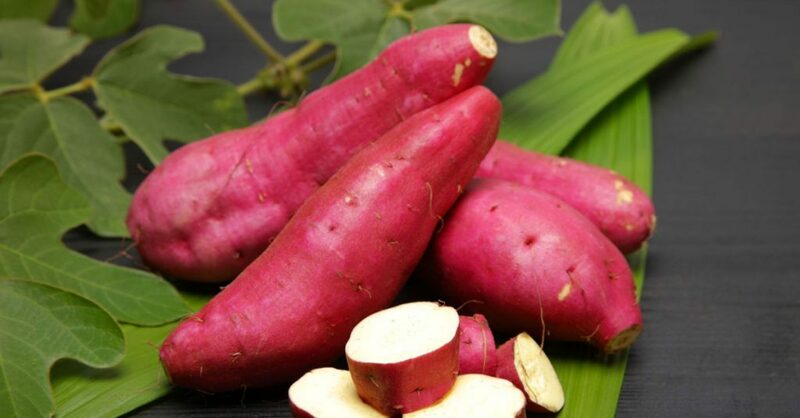 Diabetes: Sweet potatoes are excellent blood sugar regulators, and stabilize and reduce insulin resistance, so they are perfect in the case of diabetes. Immune system: The regular consumption of sweet potatoes boosts the immune system and prevents infections. Fetal development: They are rich in folates which are needed for a healthy fetal cell and tissue development. Anti-oxidant properties: They have potent antioxidant properties which fight off inflammatory issues such as gout, asthma, arthritis, etc. Emphysema: Research has found that smoke leads to vitamin A deficiency and numerous issues to the lungs. Therefore, smokers and individuals who inhale second-hand smoke should regularly eat foods rich in vitamin A. Healthy digestive tract: Sweet potatoes are rich in dietary fiber, especially concentrated in the skin, so they promote a healthy digestive tract, treat constipation, and protect against colon cancer. Muscle cramps: Potassium deficiency leads to cramps in the muscles and increased susceptibility to injury. Therefore, the consumption of sweet potatoes is recommended in the case of regular exercise, as they prevent injuries, muscle cramps, and boosts the energy levels. Stress: In the case of stress, the metabolic rate increases, and reduces the levels of potassium in the body. The consumption of sweet potatoes normalizes the heartbeat and restores the balance of this essential mineral. Heart diseases: The consumption of sweet potatoes prevents strokes and heart attacks. It supports the function of the heart, normalizes blood pressure, and maintains the balance of fluids and electrolytes. -- You should keep the sweet potatoes in the open, not refrigerated, or in plastic bags. You should store them in a cool, dark place, with good ventilation. You can keep them thus for up to 10 days. -- Avoid sweet potatoes with a green discoloration, as it shows the presence of a toxin known as solanine. Choose the firm ones, without wrinkles. -If possible, always choose the darker variant of the sweet potatoes, as it is richer in carotene. -It may be surprising, but cooking makes the nutrients in sweet potatoes more available in the body. Therefore, you can bake, boil, or steam them. -You can prepare sweet potatoes in various ways. Yet, make sure you do not remove their skin, as it includes most nutrients. You should scrub it well with a vegetable brush, and you can choose to cool it, steam it, or add it to the food processor, and mix it with flaxseed oil, honey, and yogurt, to prepare as a smoothie.